Exploit a subject or a theme to its greatest potential by bringing all possible reference to bear–then put aside the reference and create again using the potential of your unfettered imagination. Be prepared to dig around and try this and that. Time and again this third-generation work will gain “importance” and be superior to its precursors. Attempt to see through the “prima facie” material in front of you. So many artists are capable of rendering the obvious surfaces of nature. They may even bring great skill and facility to the job. Spend a minute or perhaps an hour truly looking at a subject and asking what may be the exploitable potential of the material. I’m thinking of concepts like “struggle,” “rebirth,” “monumentality,” “humility.” There are hundreds of these words, and, whether you recognize them or not, they can be found in the crevices of your individual personality. Further, you may wish to add an idea or a motif that was not remotely there in the first place. It’s this kind of thinking that makes the act of art truly satisfying and exciting, and if this means anything to you it lifts your work so it connects with the sensibilities of others who pass along in the human stream. When undertaking any art project, whether painterly, sculptural or verbal, I take on an attitude of adventuresome experiment. Knowing that the learning process is based primarily upon experimentation, for that is how we push back our frontiers, enables me to search for and seize upon serendipitous results. This unexpected discovery of new avenues of pursuit and expression of the results is strongly empowering to any artist who is willing to submit with courage to the use of the unknown as a tool. We who are artists are the true makers of reality, for it is we who are at the nexus of any expression of newness. We are, at the very least, progenitors of life style for all the others who ascribe to our ideals and methodologies. Looking around at our environment will dispel any misgivings you might have regarding this thesis, for everything you see that is man-made has an artist at its beginnings. Therefore, we create reality. I have just returned from Ireland and a painting trip. I, along with my wife Ginger, were invited to Tahilla, County Kerry, Ireland to paint with Perry & Steve Austin, Kenn Backhaus (president of the Plein Air Painters of America) and Russell Scruggs. We stayed in a private home in Tahilla near the town of Sneem on the Ring of Kerry. Painting there taught me to slow down. The people are so much more laid back. The land and the weather dictate more of life’s choices than collection of wealth or material things. I would find myself out painting at Michael Murphy’s Farm near Sneem and be wrapped up in the history and the beauty of the farm. The wind that came pouring over the mountains into the valley chilled me to the bone and just as quickly the sun would come out and throw it’s light on a mountain pasture and set it ablaze with an emerald glow. We seldom ventured 50 miles from our home base. Relationships make Ireland special. Mary the waitress at the Blue Bull, Jack Moriarty in the bar, Denise McClure, our English friend, and fellow artist Michael Murphy whose farm we painted and who invited us home for tea and bread. Time has stood still for this part of Ireland. It is a world that I long for and a place that still holds the promise of a simpler life, where art and nature are important on a level that raises it to the miraculous. I really enjoy your letters and your philosophical approach to life. While you put yourself in your work you do not seem to see mystical things that are not there that many “artists” think necessary for understanding art. I am passionate about what I do in my own way, be it a pencil sketch or a full painting in whatever medium touches me at that time. Whether they are any good in others eyes I care not. I enjoy doing them and have fun, if they share my joy, great, if I discover a new skill for myself be it already a thousand years old then I rejoice. Thank you for what you write and life to your brushes. Paint like a Millionaire. Starting from a single topic of subject based on a very normal thing I painted the first picture and then the mind started to work automatically: Oh, I thought, this has the abstract and meaningful side also and so I painted the second, the third and so on while letting my mind work out its ideas there were side effects: I collected meanwhile six other topics to be explored out of the initial single one! I started after the fifth or sixth picture in this line of series (which I never thought would be a series and is meanwhile by its 16th painting!) Not only that I got side-topics to be explored. In my incandescent desire to uniquely translate into a visual state the life forces of my environment, time becomes my archenemy. One lifetime cannot accomplish all that my art mind imagines. My brushes do not move fast enough to respond to my inspiration. My constant wish is to convey, through my orchestration of symbolic and recognizable imagery and colors, a joy commensurate to mine experienced while executing the work. Putting in that extra element of spirit is indeed the key to making ordinary works of art into extraordinary ones. I have been reading these letters for some months now and it’s well worth an artist’s while to go back through some of the previous letters to get ideas. Robert’s ideas hold water — as evidenced by his own outstanding success — which he has accomplished without ballyhoo. His success is based on the idea that quality work makes connections and this sort of thing is good to hear for those of us who have just left art schools. My own art income during the past five months has gone from $870, in January to $7200 in May. Every month has been better than the one before. How pleasant to be reminded of the Group of Seven! A Canadian friend, with whom I shared a lab in Stockholm decades ago, told me of them, and we were later fortunate enough to visit the McMichael Gallery in Kleinberg, Ontario, during a trip to Toronto (we lived in Cleveland at the time). Their work, including the variety of styles, has remained an inspiration to me, and I take advantage of every opportunity to see it again. The comment about ‘generational’ growth of paintings is very interesting, and rings true from my own experience. My feeling is that artistic expression is itself a continuing journey, with differing paces, differing vistas, and differing choice of expressive means. 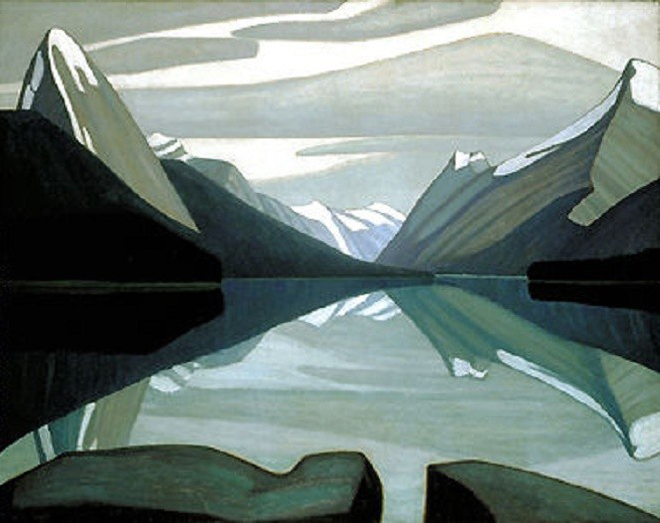 I have a great admiration for the work of Lawren Harris and think of you both when I turn my canvas upside down to design my skies. His paintings have taught me to feel and experience the rhythm of the landscape. Rhythm is a design element that isn’t used frequently as more people are impressed by colours, value contrasts, lost and found edges etc. Harris’s abstracts still retain the rhythm of his landscapes even though the subject has been removed, a direction I would like to pursue myself. Last weekend I painted in Race Horse Pass, in the Crowsnest area of Alberta. Sketching at an altitude of 6500 feet with the road blocked by snow to my right and an indigo sky of the approaching storm to my left was an exhilarating experience. A guide had driven us there in his old four wheel drive vehicle and his knowledge of the mountains and the weather patterns prevented us from getting soaked by the downpour that the artists in the valley were experiencing. Looking at last weekend’s sketches before painting this morning I smiled, knowing that they felt “Canadian” and not because they were mountain paintings. It was because I felt I had expressed my adventure in them as Harris so often did. It’s good to read what the heart knows about art and painting. Your letter on “finding spirit” reminded me of my painting partner, John Ambrosio Losonczy. I asked him if he wanted to join me and be a painting partner in my studio. I gave him a key. Like a child he would come into the studio. Like a teen his energy flowed. First he built easels for both of us — eight feet tall and five feet at the shelf. He told me how he and his wife escaped from Budapest with their son wrapped in the lining of her fur coat — in the middle of January, raw with cold. He told how he trained from youth to be a dancer. How he enjoyed the symphony in Vienna. How his college roommate was not shy at making love to his girlfriend in their 8 x 10 bedroom. But when creative silence came to us he primed his Masonite, two coats, always cross-graining then sanding smooth for the final gesso. Silence of creation fell and though we were two easels, black and white, young and old, male and female, the silence had us in unison. At times we even took the same steps back to observe our work. Silence of creation, in unison, in our grand finale to the Rite of Spring. I am still at art college. Regarding your recent letter about success — there is no simple panacea. As you suggest for us artists it’s all in the details — elements of quality wrought by observation, practice, depth of character — all go to the making of joy and success. There is no simplistic “Prayer of Jabez” that can be called up for the chosen among us in order to push the others out of the nest. Your ideas empower everyone who will take the trouble. My wife and I have long been intrigued by the wonderful designs made by “engraver” beetles on the inner bark of western coniferous trees. Last month on a back road here we came across hundreds of large chunks of bark from a western larch which had been felled and bucked into firewood. The engraver beetles had done their art, and the dang woodcutter left me the best part of the tree! I brought a pickup load to the studio. I have just finished molding the first of these engraver designs in rubber, and shall now cast handmade paper pulp onto the mold, capturing the beauty of these little beasties to share with others who don’t have the privilege of being in the woods every day. Boy was I surprised this morning when I went to my mailbox and found my complementary copy of the new book Composition Secrets of the Professionals. I had to sit down right away (in the midst of packing up my home studio to move into my “away place.”) surrounded by boxes and have a look at the images. I was so engrossed I almost missed my son’s graduation ceremony! The book is WONDERFUL and I can’t wait to read it all the way through. What a wonderful variety of work! Thanks so much for sharing with us, not only in your marvelous letters (and thanks so much for the clickbacks — they are awesome!) but in your books. Now to decide if the new composition book comes before or after Dreamway!! So much to read, so little time. Thank you also for the “Painters Keys.” I have a copy that is well highlighted, so will give this new one to a deserving student of mine as a reward for hard work and perseverance. I feel so much more connected to and supported by the art community thanks to your initiative. I would have liked to join you on your workshop with Steven Quiller this fall, but unfortunately it is not possible this year. You two are certainly heroes of mine. Thanks so much again for your generosity and time.